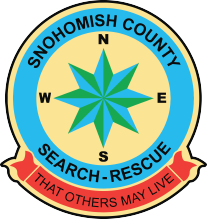 The K9 Team is a part of Snohomish County Volunteer Search and Rescue, a non-profit organization. The Snohomish County Volunteer Search and Rescue (SCVSAR) K9 Team is an all-volunteer organization delivering emergency response to those in need across the county’s urban and wilderness areas. It is our mission to search, rescue and/or recover those who become lost, missing or injured while outdoors and to educate people on outdoor safety and wilderness recreation. Our K9 teams deploy on searches that include Wilderness Airscent, Trailing, Avalanche, Human Remains Detection, Disaster and Water Search. You can follow our trail on Facebook, here. The K9 Team meets at Taylor’s Landing on the 2nd Wednesday of each month.